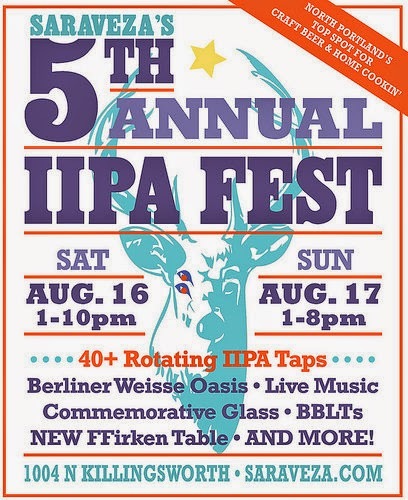 On August 16th and 17th, Saraveza will be hosting their 5th annual IIPA Fest from 1pm-8pm in their main building and spilling into The Bad Habit Room. The event will feature over 30 rotating Imperial IPAs, Double Bacon BLTs, a new table dedicated to firkins, a Berliner Weisse Oasis & live music; sounds like an incredible time! The festival will cost you $20 and you get a commemorative glass and 10 drink tickets that are good for a 4 oz. sample (Some bigger beers may be two tickets). They suggest you purchase tickets in ADVANCE. Saraveza is not a huge venue and may sell out. They HIGHLY recommend purchase of advanced tickets. Festival goers will have the opportunity to try unique IIPA Fest beers made by Block 15, Base Camp Brewing Co, Coalition, Gigantic, Solera and more! This year also boasts the release of “Freaky Nasty”, an Imperial IPA brewed by the Saraveza crew with Breakside Brewery especially for the Fest! The draft list also includes classics like Hopworks “Ace of Spades” , 10 Barrel “DUB”, Avery “Maharaja”, Dogfish Head “120 Minute” & Goodlife “Comatose”. Look for some surprise IIPAs (and even some IIIPAs) from both near and far making their way onto the festival list. Taps will be rotating at Saraveza, Bad Habit Room and in the outdoor seating area on N. Michigan. To compete with big bold IIPA flavors, Saraveza has brought back their infamous BBLT (Bacon x 2)! Also they have added Berliner Weisse sorbet cones which will aid as a refreshing palate cleanser between the crazy hoppy goodness! The musical accompaniment will be from NW talents: Carinne Carpenter, Flat Rock Stringband & Ryan McAlexander. Check back later for a full tap list!